Kajiado is an area roughly equivalent in size to Northern Ireland located to the south east of Nairobi stretching from the city down towards Mount Kilimanjaro. It is a arid and poor area of Kenya. Kajiado regularly suffers severe droughts. After each one it takes a long time for the local population to rebuild lives, livestock and crops. Despite this the people there have a tremendous faith and we have a lot to learn from them. Kajiado has developed greatly since 1980 when it had just one Parish and six Clergy, to a large Diocese in 2014 with 40 Parishes and over 60 Clergy. It has three main areas of development: Mission and Evangelism; Education and Training; Social Outreach. On entering the 21 Century as part of the plans for development and the building of a new Parish Centre, the Select Vestry committed us, as a parish, to give ten percent of what we raised to help the Diocese of Kajiado in their development. This included support towards the construction of a Diocesan Headquarters building but it also includes some of us visiting Kajiado with our skills and some of them visiting us with their skills. The close partnership between Kajiado and our Parish has existed since November 2003 when Yvonne and Lawrence Manogue visited. Lawrence then started drawing plans for the ‘new’ Diocesan Centre. Funded by our tithing, it is now complete and open for the use of the clergy and people. As some of the meeting rooms and office space will be let, this is now a self sustaining project. In October 2004 on presenting the initial gift to the diocese, we were very honoured to be described as the honorary 19th parish of the Kajiado Diocese. This truly cemented the relationship that has grown from the partnership. This is remembered in our Kajiado Room in our own Parish Centre where Karibu hangs above the door and this word of Welcome is recognised by our Swahili speaking visitors. When visiting Ballyholme in 2014 Bishop Gadiel thanked the Parishioners for enabling this building to be built and he said he hoped that our Parish would be well represented at the official opening in 2015. 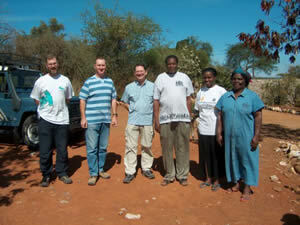 The most recent visit to Kajiado was the 2013 visit of the CMS Ireland Uhusiano (‘Partnership’) Team. As well as working in Nairobi slum projects they worked in helping to complete the new Diocesan Training Centre. This facility will be used to help train up strong church leaders to manage the phenomenal growth being experienced in the diocese. This is a very exciting part of our own vision for the future that will help us to look beyond our own needs and shores. With the difficulties in the world wide Anglican Church this vision is critical as we seek to protect the unity of the church for which Jesus prayed.